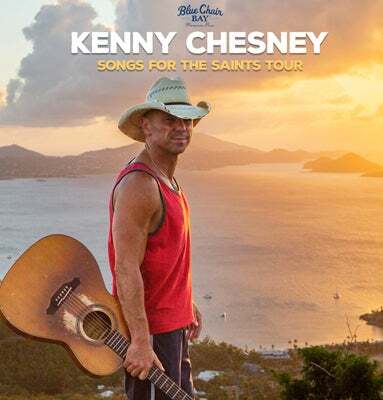 Focusing on smaller venues and markets not directly impacted by his massive stadium tours, Kenny Chesney sought to make his Songs for the Saints 2019 Tour mirror the intimacy of its namesake album. Inspired by the resilience of the people around him, Chesney doubles down on the human connection for his 2019 tour by seeking those members of No Shoes Nation who have spent the past decade and a half making the trip to stadium markets for what is now a summer tradition. The songwriter/superstar from East Tennessee whom Variety called, “Country music’s only true long-term stadium act” and The Wall Street Journal deemed, “The King of the Road” announced 11 arenas in what, for an artist who does 18, 19, 20+ stadiums a year, might seem like outlying markets. With the response being so strong, he adds another half-dozen cities beyond the obvious to his Songs for the Saints 2019 Tour. Setting and often breaking his own records with 2018’s Trip Around the Sun Tour – including over a million fans at Foxborough’s Gillette Stadium and becoming the single biggest-seller at New Jersey’s MetLife Stadium – the 8-time Country Music Association and Academy of Country Music Entertainer of the Year took his time deciding how he wanted his 2019 tour to roll out. Having merged amphitheaters with 19 stadiums, it was a block buster year. Rather than do more of the same, Chesney decided to do something totally out of the box. Kicking off April 4 at Louisville’s YUM! Center, the tour will come to Greensboro Colisem on Frida, April 12. Ticketing information is to be announced.